Sinister Wisdom 101: Variations celebrates the fortieth anniversary of Sinister Wisdom in 2016. 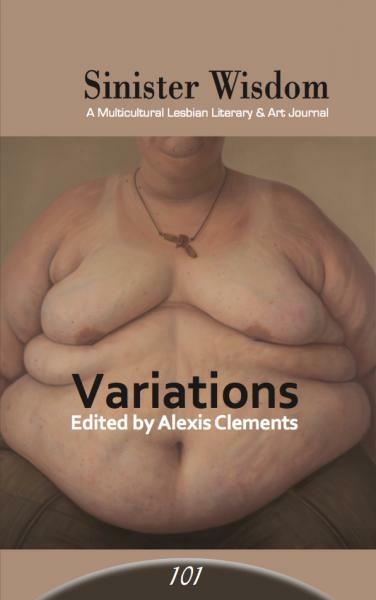 Sinister Wisdom 101: Variations explores different variations of lesbian-feminism. The truth is that women have not stopped loving women, and there is no indication that phenomenon will ever go away, but the language and culture of those women remain as variable today as they were in the twentieth century. Another truth is that patriarchy and its attendant misogyny continue to drive people of all genders to diminish women and those who align themselves strongly with the feminine. What remains less clear today is the political piece of the equation--where and how does feminism link up with lesbianism today? Sinister Wisdom 101: Variations has many voices—old and new—exploring vital questions to our lives today. Creative work in Sinister Wisdom 101: Variations is by Elvis B, Susana Cook, Leah Gilliam, Trish Salah, Stacy Szymaszek, Fran Winant, and many more. Sinister Wisdom 101 is sold out. It is available as an ebook here.